While the projections and prospective of aerogels seem exuberating. After huge R&D, researchers are still uncertain to put these diversities of aerogels for marketable and business use. The most applied use of aerogels now is thermal insulation. Insulating products made of aerogel materials are gaining huge admiration in the United States and the coldest regions of Europe. Moreover, thermal insulation aerogels are also used for acoustic and optical insulation in the buildings. The building construction industry is careful to have the largest cost-effective and energy-saving potential impact. Space heating is the utmost energy exhaustive end-use in homes accounting for 70% of the total final energy consumption. Currently, silica aerogel thermal insulation in modern buildings has become a critical way to meet the difficulties of enhanced energy efficiency, by which the conduction of heat through walls, ceilings, windows roofs, and floors can be retarded efficiently. However, the high production cost is the remains to be the major challenge for the market players and market growth during the forecast period. Goldstein Research analyst forecast global aerogel market is anticipated to garner USD 2.3 billion by 2025. Further, the aerogel market is expected to expand at a CAGR of 16.3% during the forecast period i.e. 2017-2025. Based on the aerogel form, batteries accounted for the largest revenue share of more than 70%, which is likely to expand at a CAGR of 24.2% during the forecast period. Blanket aerogels are broadly used in the construction sector, which is the key factor likely to determine the fastest growth of this segment. Based on geography, North America dominates the global aerogels market with more than 52% share in global aerogels market. The dominance of North America is majorly attributed to the high consumption of aerogel insulation materials in modern buildings in order to reduce energy consumption. On the other hand, China is likely to be the fastest growing region at CAGR of +22% during the forecast period, owing to huge production base in China and rising adoption of advanced insulation materials for building construction. The report covers the present ground scenario and the future growth prospects of the aerogel market for 2017-2025 along with the market players’ analysis. We calculated the market size and revenue share on the basis of revenue generated from major players in all major regions. Global aerogel market is forecasted on the basis of revenue analysis, product benchmarking and strategic developments of key market players. Global Aerogel Market Outlook 2017-2025, has been prepared based on an in-depth market analysis from industry experts. 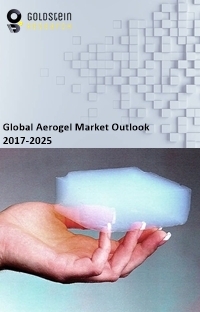 The report covers the competitive landscape and current position of major players in the global aerogel market space. The report also includes Porter's five force model, SWOT analysis, company profiling, business strategies of market players and their business models. “Global Aerogel Market Report” also recognizes value chain analysis to understand the cost differentiation, pricing models to provide a competitive advantage to the existing and new entry players. Our Global Aerogel Market Report comprises of the following companies as the key players: Aspen Aerogels, Cabot Corporation, Aerogel Technologies, Nano High-Tech, Guangdong Alison Hi-Tech, Active Aerogels, Enersens, Jios Aerogel Corporation, Insulgel High-Tech, Protective Polymers, BASF, Guizhou Aerospace, Green Earth and Aerogel Technologies (GEAT).